For example, in semiconductor manufacturing, contamination gradually increases over time inside the various kinds of system, where reaction products are deposited as well. When such contamination and deposits reach a certain level, they peel off and contaminate the IC in the manufacturing, causing product defects. Thus, to effectively maintain the system, it is necessary to remove the system component parts and perform precision cleaning on them. Precision cleaning removes dirt and deposits invisible to the eye. That is, it removes even the minute particles and ionic substances that cause manufacturing problems in such fields as electronics and precision machinery. Precision cleaning contributes to increasing the yields of manufacturing system and to reducing manufacturing costs. Through use of liquid chemicals, chemical cleaning technology makes it possible to uniformly clean objects drawing on chemical reactions of such cleaning solutions to reach every nook and cranny, even when it comes to objects featuring complex shapes and structures. We remove contamination using our unique proprietary chemical compounds containing acids, alkaline substances and organic solvents mixed with the fundamental notion of protecting base metals. Our company select optimal chemicals, fully leveraging the extensive technologies and know-how we have amassed over many years. Physical cleaning technology is used for removing sparingly soluble deposits and rectifying surface roughness through treatment involving high-pressure water, blasting, ultrasonic, polishing and other such means. Our company possesses various kinds of cleaning system able to handle oversized components and materials, so physical cleaning of such large components and materials is also possible. Once contaminants have been removed, components are put through several water-based cleaning processes and then transferred to the drying process. The quality of components that have undergone cleaning varies substantially depending on the purity of water used in their cleaning and water-based cleaning methods used. 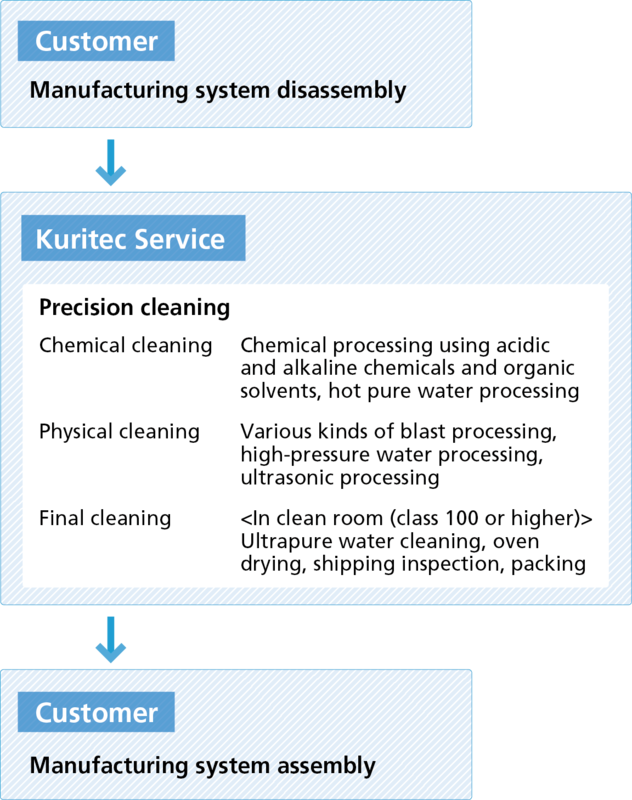 Our company use Kurita’s ultrapure water in clean rooms of class 100 or higher, and thus provide the highest quality of finishing. We have experience in cleaning system used in a wide variety of processes. Ion implant, CVD, photolithography, dry etching, PVD, etc. 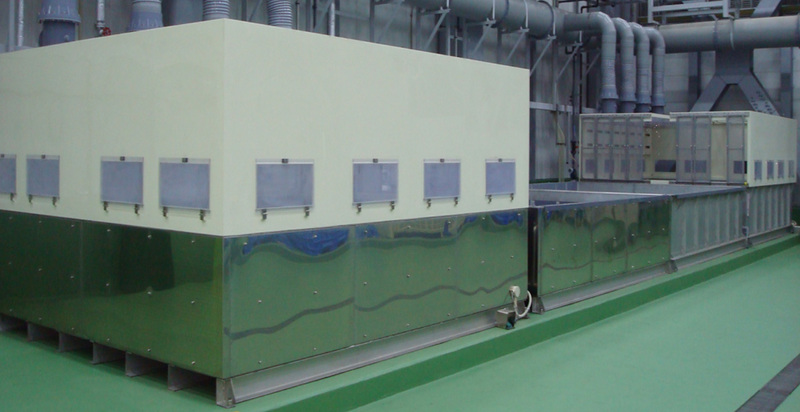 We can remove various kinds of deposited film and clean parts of various materials. Metals (Al, Cu, Ti, Ta, etc. ), alloys (SUS, hastelloy, alloy 42, etc. ), resins (PP, PEEK, teflon, etc. ), ceramics (yttria, alumina, SiC, etc. ), carbon, quartz, silicon, etc.